There are two lion statues outside the front of this building on 5th Avenue in NYC. They were always the draw to this library for me because my mother had bookend copies on her shelf for as long as I can remember. They symbolized knowledge, learning, strength, and contentment. Less familiar to me are these reading rooms inside. The artwork on the ceiling is wonderful, I just had to sit down and stare at it for a long time. The room was quiet and in order to take a base picture to work from I turned off my flash so I could be as discreet as possible. 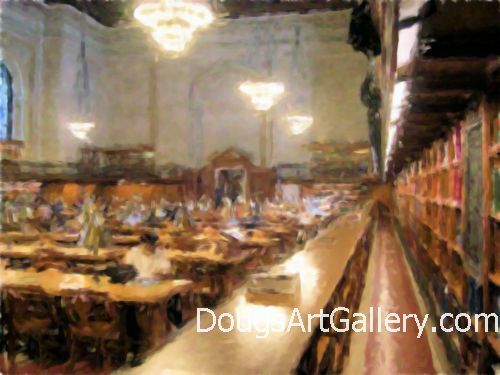 Click here to leave New York City Public Library for more links to artists and their online art galleries, art prints and art posters. Browse the links found at the bottom of Home Page.